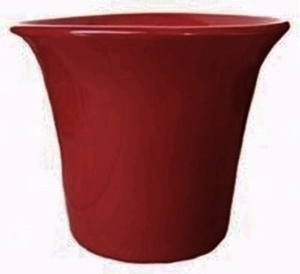 A wide flare opening, tapered base, bold bright glazed colors with high gloss finish all describe our Spanish flowerpot. The large flared opening at the top give this basic garden planter it's a decorative name. This Spanish style of the garden planter has a wide variety of sizes to choose from making these garden containers a favorite. 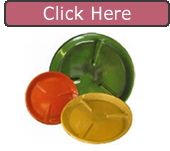 Get your tape measure out when selecting a size because these containers are large. Pair them and switch up the color combinations to create a lively, interesting landscape display of color. Place this pottery on a patio, porch or in a yard location where you want to plant evergreens, flowers, succulents or bulbs. Indoors or Outdoors but please don't expose to freezing temperatures.